'The Brazilian Bombshell' was born Maria do Carmo Miranda da Cunha in Portugal, then emigrated with her family to Rio de Janiero, Brazil. Her first job was in a tie shop, and then she opened a successful milinary shop, but she had dreams of stardom, which she chose to keep from her parents. She got her break as a samba singer and her energy and talent quickly helped her rise to fame in Brazil , then led her to the US, where she worked with her band, Bando da Lua. Her career in the US coincided with attempts by the the US government to strengthen the bond between South America and the US - Franklin Roosevelts 'Good Neighbor Policy'. Many in Brazil criticized her act as a lampoon, but she actually helped to give people in the US something in South America they could relate to: the music. In 1945, she was the highest paid woman in the US at $200,000. She starred in 14 US-made and 6 Brazilian films, has a star on the Hollywood Walk of Fame . She suffered a heart attack onstage while performing on the Jimmy Durante show in 1955 and died the next day. Her act has become legend, as have the outrageous clothing that she wore onstage. 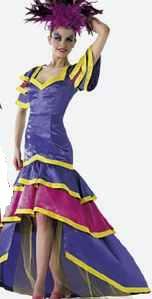 #H214 Flamenco style dress with fitted torso and flared three tiered skirt, blue and red trimmed in yellow. Bell sleeves are also three tiered. Zipper back closure. Headdress is fitted with fruits and leaves.